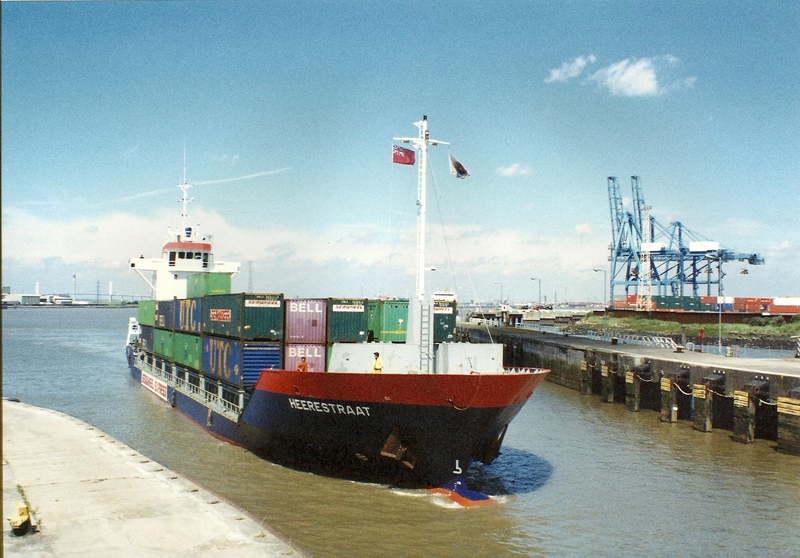 The feeder ship HEERESTRAAT entering Tilbury locks. The container feeder ship HEERESTRAAT, built in the Netherlands in 1997, of 2035 tons gross, 2800 deadweight, was built for and owned by Scheepvaartonderneming Heerestraat, of Groningen. In 2004 it was sold to a related company and renamed JETSTREAM, and in the following year went to a German outfit and flew the Antigua and Barbuda flag as SEAWHEEL EXPRESS. In 2008, it went to its current owner, Vaagebulk IV A/S, which is managed by Vaage Ship Management A/S, of Bergen, Norway. It flies the flag of Bahamas and is registered at Nassau under the name KRISTIN D. Its area of trading has been all of Norway, North Sea ports and the Baltic.